Embark on a once in a lifetime adventure. Travel by air, water, road and rail through Southern Africa’s breathtakingly beautiful landscapes and encounter its legendary horizons, wide open spaces, mountains, rivers and people. Upon arrival at Lusaka International Airport in Zambia, board your private aircraft for a 30-minute air transfer to Baines’ River Camp on the Zambezi River. Depending on your arrival time at the camp, you will enjoy an afternoon safari activity of your preference. For the next two days, explore the Lower Zambezi Valley. Boasting over 5,000 square kilometres of unfenced yet protected habitat, this safari destination has remained free of mass tourism. Game viewing and birding is offered in open vehicles, on foot and by boat. A gentle canoe safari down one of the beautiful tributaries of the Zambezi is pure magic and for those with a sense of adventure, Tiger Fishing adds s an extra kick of adrenalin to your safari. You will also have the opportunity to visit and engage with the local communities and conservation organisations. Baines’ River Camp also offers sunset cruises and spa treatments. On your last morning at Baines’ River Camp, a river transfer along the banks of the Zambezi awaits, followed by a road transfer to Lake Kariba in Zimbabwe. Upon boarding at Marineland Harbour, MV Matusadona sets off onto Lake Kariba and you are invited to feel at home on your private safari cruiser for the next few days. 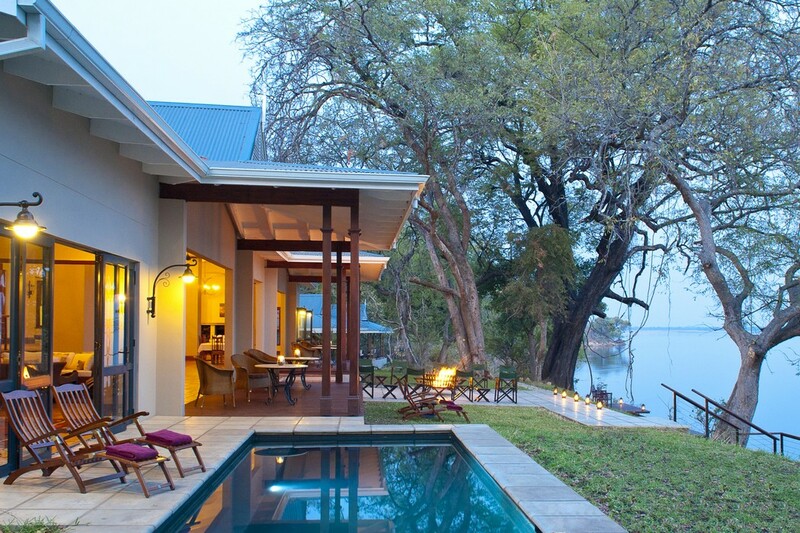 You will enjoy game viewing by motorised boats and some bream and Tiger Fishing during the mornings and afternoons. 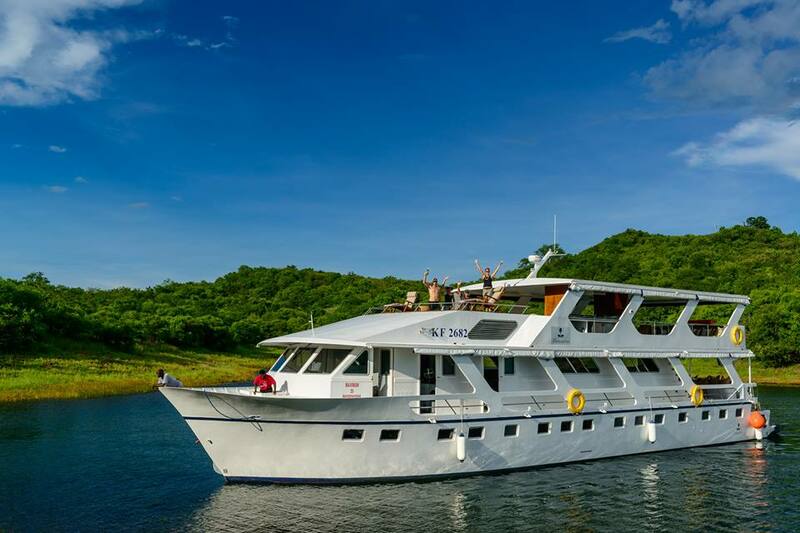 The vessel cruises to a new destination daily, giving you the opportunity to enjoy the ever-changing vistas of Lake Kariba and view wildlife on the shoreline of the Matusadona National Park. MV Matusadona is undoubtedly Lake Kariba’s most prestigious safari cruiser, measuring 28.6 metres in length and 6.5 metres on the beam, comprising of three levels with air-conditioning throughout the indoor areas and 3 well-appointed en-suite cabins. Service excellence is guaranteed by a crew of four, consisting of the voyage manager, captain, cook and deckhand. Lake Kariba is renowned for its vast expanse of water, breath-taking sunsets, game viewing, prolific birdlife, sport angling and simply the joy of cruising in an extraordinary water wilderness. During breakfast, you’ll cruise towards the Bumi Harbour where a game drive vehicle will transfer you to your private charter flight, taking off from the Bumi Airfield and landing at Victoria Falls. This historic town offers so many excursions, that you will have trouble fitting it all into a few days there. Choose from helicopter or microlight flights over the Falls, guided tours of the Falls, the famous adrenaline activities such as bungee jumping, white water rafting and gorge swings or a champagne tram ride onto the bridge at sunset. You will be accommodated in exquisite Stable Rooms at the Victoria Falls Hotel, a grand dame which has been preserved true to its original style and has an outstanding reputation of service excellence. You will have most of the day to visit the town’s famous craft markets and enjoy a traditional high tea at the Victoria Falls Hotel. You will board the iconic Rovos Rail directly from the Hotel for an extraordinary journey on the most luxurious train in the world. During your time on board you will travel through spectacular scenery and enjoy gourmet meals in the comfort and style of a bygone era. Your first morning on board the train commences with an early wake-up call, followed by a light breakfast, before you enjoy a game drive in the famous Hwange National Park. On return to the train, brunch will be served as you continue your journey. The train winds its way southwards through the beautiful Zimbabwean countryside, best viewed from the observation car’s veranda with a gin & tonic in hand. On day 11 you will enter South Africa and the journey continues through the beautiful Waterberg area to Pretoria. 3 nights on board MV Matusadona, includes private charter and cruise, meals, drinks, in-house safari activities, laundry, park fees, community and conservation contributions. 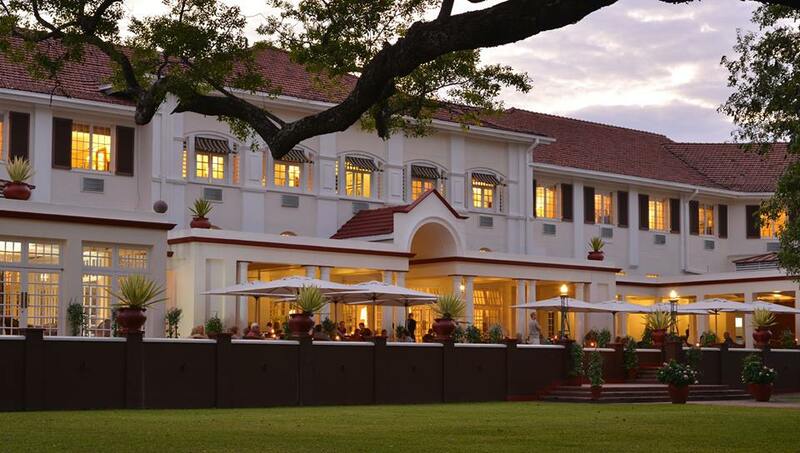 2 nights at The Victoria Falls Hotel in Stable Rooms on a Bed & Breakfast basis, includes complimentary afternoon tea, cocktail, mini bar and a massage voucher. 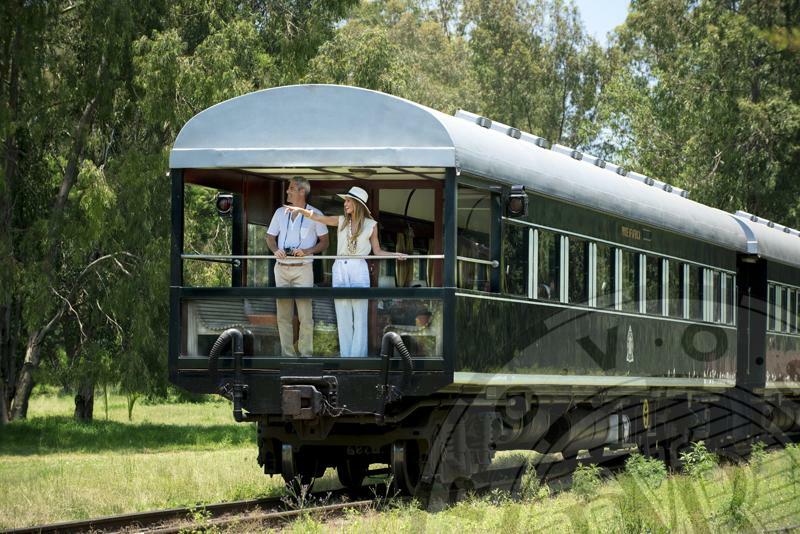 3 nights on Rovos Rail in Deluxe Suites, includes rail journey from Victoria Falls to Pretoria*, meals, drinks (except French Champagne), 24-hour room service and bar facilities, limited laundry, guided game drive in Hwange National Park; Transfers as specified; statutory taxes and levies. * Circumstances may cause the Rovos Rail journey to route via Botswana. Unspecified transfers, visas, wellness treatments at Baines’ River Camp, purchases of a personal nature, activities operated by third parties unless specifically included. The above starting rates are based on bookings for 6 adult travellers and a ROE for the Rovos Rail portion of USD 1.00. Child rates and single supplement rates available. Minimum age restrictions of 6 apply. Additional age restrictions apply at Baines’ River Camp as per government regulations: canoeing safaris (12) and walking safaris (14) at Baines’ River Camp. Please enquire for rates for smaller groups. Contact us to book this once in a lifetime adventure.